Go to original pattern for design DROPS 174-4. 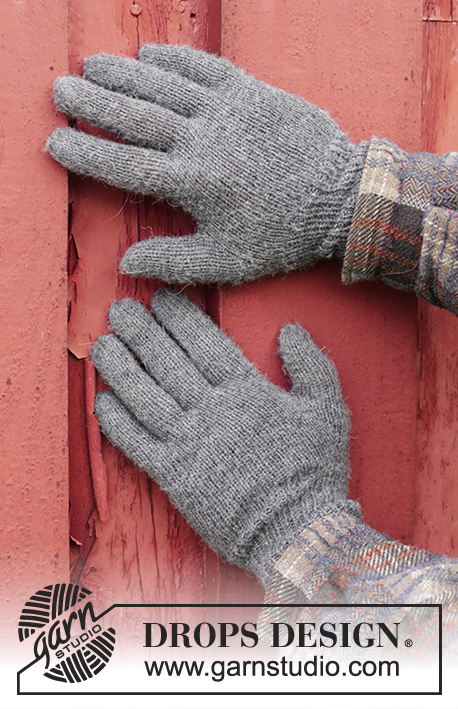 Knitted DROPS gloves for men in Fabel. Size S - XL. 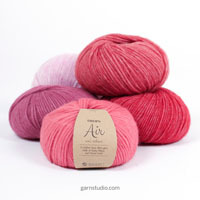 DROPS DOUBLE POINTED NEEDLES SIZE 2.5 mm - or size needed to get 26 sts x 34 rounds in stocking st = 10 x 10 cm. Inc 1 st by making 1 YO. To avoid holes K YO twisted on next round. Worked in the round on double pointed needles. Cast on 58-66 sts on double pointed needles size 2.5 mm with Fabel. K 1 round, then work rib (= K 1/P 1) for 7 cm. Insert 1 marker, NOW MEASURE PIECE FROM HERE! K 1 round while dec 4-6 sts evenly = 54-60 sts. Then work in stocking st. 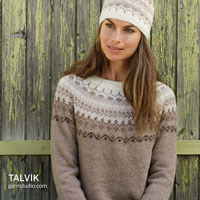 REMEMBER THE KNITTING TENSION When piece measures 1-2 cm, beg inc for thumb gusset. Inc 1 st on each side of the next to last st on round – SEE INCREASE TIP (= 2 sts inc). Repeat inc every 3rd round a total of 6-7 times (inc on each side of the inc sts) = 13-15 thumb sts and 66-74 sts in total. 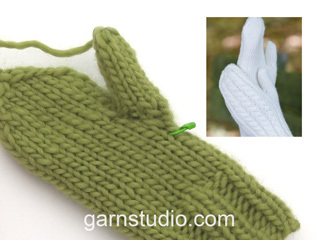 When piece measures 6-7 cm, slip thumb sts + 1 st on each side (= 15-17 sts) on 1 stitch holder. Cast on 3 new sts behind the thumb sts = 54-60 sts. Continue in stocking st in the round until piece measures 9-11 cm. 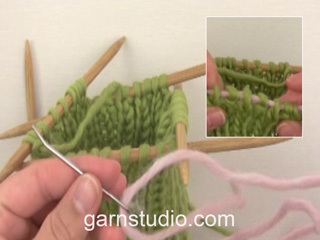 Now slip the first 21-23 sts on round (= on top of hand) on a stitch holder, keep the next 12-13 sts on needle and slip the last 21-24 sts inside the hand on another stitch holder. = 12-13 sts, cast on 1 new st towards sts on stitch holders = 13-14 sts. Work in stocking st in the round for approx. 5½ -6½ cm, then K all sts tog 2 by 2. Cut the yarn and pull it through the remaining sts, tighten tog and fasten. 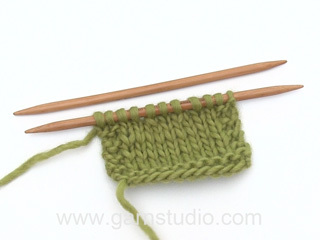 Slip sts from stitch holders back on the needles, pick in addition up 2 sts towards the little finger = 44-49 sts. Work 2 rounds in stocking st. Keep the 2 sts that were pick up towards the little finger + 6-6 sts on top of hand and 6-7 sts inside the hand on the needle. Slip the remaining sts back on 2 stitch holders (= 15-17 sts on top of hand and 15-17 sts inside the hand). = 14-15 sts, cast on 1 new st towards sts on stitch holders = 15-16 sts. Work in stocking st in the round for approx. 7-8 cm, then K all sts tog 2 by 2. Cut the yarn and pull it through the remaining sts, tighten tog and fasten. Slip the next 7-8 sts from each stitch holder back on the needle, knit in addition up 2 sts towards the ring finger and cast on 1 new st towards sts on stitch holders = 17-19 sts. Work in stocking st in the round for approx. 7½-8½ cm, then K all sts tog 2 by 2. Cut the yarn and pull it through the remaining sts, tighten tog and fasten. Slip the remaining 16-18 sts from stitch holders back on the needles, pick in addition up 2 sts towards the middle finger = 18-20 sts. Work in stocking st in the round for approx. 6½-7½ cm, then K all sts tog 2 by 2. Cut the yarn and pull it through the remaining sts, tighten tog and fasten. 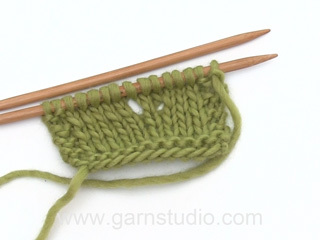 Slip the sts from thumb gusset on the needles and knit in addition up 3 sts along the edge behind the thumb sts = 18-20 sts. Work in stocking st in the round for approx. 5½-6 cm, then K all sts tog 2 by 2. Cut the yarn and pull it through the remaining sts, tighten tog and fasten. Work as left but reversed, i.e. inc for thumb gusset on each side of second st on round (instead of each side of next to last st on round). ... (folytatás) ennél súlyosabb hibák is gyakran előfordulnak. Ebben a kötésleírásban például a kézfejnél azt írja, hogy folytassuk 3mm-es kötőtűn, holott se az angol leírásban nem ír ilyet, sem a szükséges eszközöknél. Hoeveel steken voor welke maat? Als er staat 'Zet 58-66 st op...' dan betekent dat dat je 58 steken op moet zetten voor maat S/M en 66 steken voor maat L/XL. Buongiorno Sara, si, il 174 è un catalogo di modelli da uomo! Buon lavoro!